As I got slowly introduced to more of amazing Spanish cuisine, through tasting wide selection of jamon, Spanish cheeses, olive oils and olives, I also came across some less known Spanish delicatessen. My Spanish friends were kind enough to show me how to serve them. 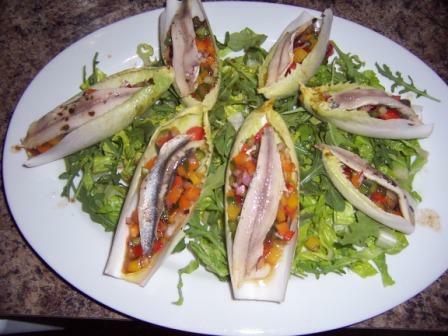 This is a lovely way to serve marinated, mild white anchovies called Boquerones. If you say in your head “I hate anchovy!” let me tell you: this is not the salty anchovy from the jar. This is a completely different “animal”. Clean each bell pepper from seeds, wash and finely chop half of each colored peppers into little cubes. Mix in a salad bowl. Reserve the other halves for another use. Finely chop red onion and mix with peppers. Add capers without a liquid. Add in your favorite vinaigrette and mix together. Wash endives clean and discard outer leaves. Carefully peel each leave off – cut off the thick white end so they don’t break. Spread endive’s leaves onto a bed of sliced Romaine hearts so they hold in place like little canoes. I have added some baby arugula too and sprinkled a little bit of the same vinaigrette on it. (When all canoes are gone, you can add some chopped tomatoes to the party and finish the underneath salad). Take anchovies out of the oil. Carefully spoon a little bit of pepper’s mixture into each canoe and garnish with 1 Boquerone per each canoe. Try delicious Naia from Spanish Rueda with this Spanish appetizer. As you already know, I always reach for the same country of origin wines, when pairing with food. This is definitely a match made in heaven. 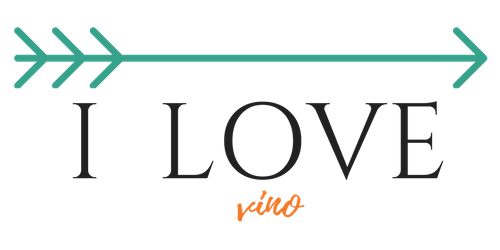 Naia Verdejo, from the region close to ocean, and delicate marinated anchovies… yummy!